Ok people. This is getting ridiculous. Vulture has found these insanely decorated cupcakes from Regali Kitchen’s Facebook page. The question is….can you recognize all the houses just by their fondant sigil? Krakens look good even on cupcakes! I shouldn’t complain. These look delicious. I bet the Stark cupcake tastes like winter. This entry was posted in TV and tagged @gameofthrones, cupcakes, entertainment, food, Game of Thrones, George R.R. Martin, HBO, television. Bookmark the permalink. 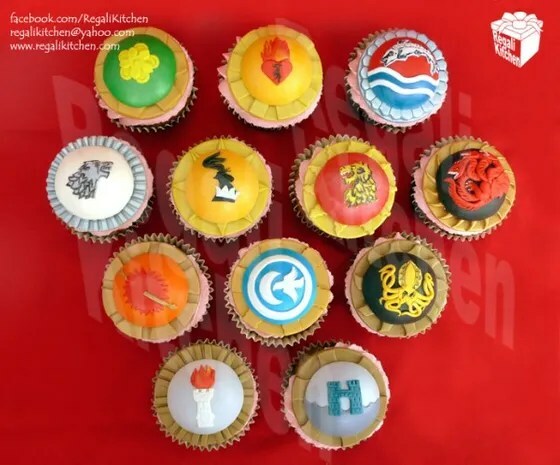 1 Response to Game of Thrones….cupcakes? Hey, there were cake pop- heads-on-spikes. Why not cupcakes?